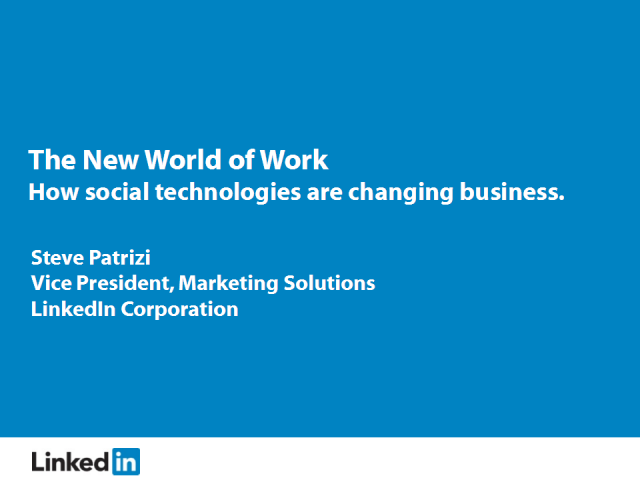 Steve Patrizi leads the advertising sales and operations organization for LinkedIn, the world’s largest professional network with over 50 million members. His team works with the world's most widely recognized brands and advertising agencies to help them connect with LinkedIn’s audience of affluent, influential, and ambitious professionals. Steve joined LinkedIn from Microsoft Corporation, where as Manager of Advertising Sales he led a team tasked with delivering cross-platform digital marketing solutions for Fortune 500 accounts based in the San Francisco Bay Area. Prior to Microsoft, Steve spent 10 years with Dow Jones & Company in various roles, including 5 years as Director of West Region Advertising Sales for The Wall Street Journal Online. Steve has served on the board of the Bay Area Interactive Group, and is a graduate of Rutgers University with a bachelor’s degree in Communication.